Mollie Katzen’s 1977 Moosewood Cookbook has long set the standard among vegetarian cookbooks; readers love the hand-lettered recipes and charming drawings by the author, as well as the time-tested healthy and wholesome recipes. 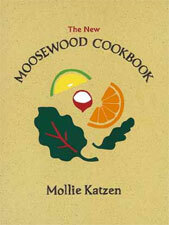 Over the years, Katzen has revamped the original Moosewood, rewriting many of the recipes to be, as she says, “more streamlined in preparation — and lighter in ‘weight,’ while richer in flavor.” Furthermore, fine color photographs and new savory creations from Katzen’s TV series were added to enhance this latest edition. Still a classic.